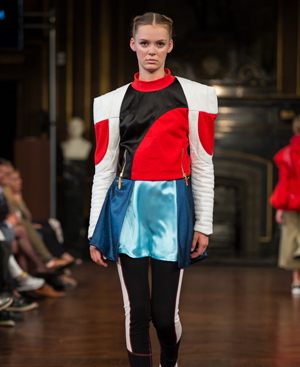 The graduation show ‘Future of Fashion’ which took place at Børsen in Copenhagen in June, will now be a part of the international fashion fair “Gallery” during Copenhagen Fashion Week 2014. From Wednesday the 6th to Friday 8th of August you can meet designers and see products from the graduation show ‘Future of Fashion’. With the students’ presence at the Gallery, the fashion industry is able to forge even closer ties with the young talents. At the same time, companies who missed this year’s Future of Fashion show, can drop by the stand and meet the designers, see their collections and hopefully become inspired be their new ideas. The exhibition gives companies, press and people within the fashion world insight into what’s happening at the The Royal Danish Academy of Fine Arts, TEKO/ Via University College and The Design School Kolding.